My sincerest apologies for my latest absence from the blogging world. A combination of poor health and Internet woes conspired against my posting. However my issues with regards to Internet connectivity shall hopefully soon be resolved. A veritable army of ants, wearing shiny red boots on each of their tiny feet and traditional yellow hard hats upon their shiny heads, are working on the problem as we speak. Indeed they thankfully all seem to be working most tirelessly, by which I hesitantly include those few ants, who in their ostensibly blithe manner, stand around and oversee the others, managing away. I have the feeling that I shall be soon making a swift dash from the rather tumultuous cover of British Telecom to the depths of Virgin Media. A lack of Internet really does allow one a curious sense of freedom. And I suppose here is the point where I would share those rather tired expressions of a world enslaved to modern technology (which is the foundation for contemporary technology, a rather important distinction in actuality). Indeed, my thoughts may be somewhat related to these recent events. 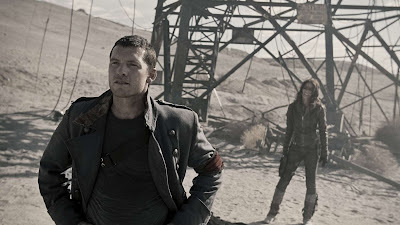 As for the past few days I have pondered the costume design of films set in a Post-Apocalyptic and Dystopian world. It appears that the on screen worlds inhabited by future man, are invariably born from a post-war, -destruction, or -otherwise horrific turn of events. These which, besides from providing a wonderful setting for that inevitable heartwarming final display of the inherent strengths of humanity (usually being first seen as a weakness by the enemy) and our ability to love, also provides a stunning visual feast of design. These bleak and yet fascinating post-war based environments, or otherwise Cyberpunk/Steampunk designed futures, give way to a whole plethora of intriguing, usually indirect, commentaries on the arts and fashions (or indeed lack thereof) of the advanced human race. Of course, where one notes advanced human race, this tends to meant in terms of technological advancement and its resulting crippling of humanity. The conflict between man and machine, that oldest of inspirations, is still as relevant today as it was at the advent of the Industrial Era. Yet, humanity in these settings is usually regressed to technological utilitarianism, by which I mean that technological wonder does not exist, but rather technology exists merely to be used begrudgingly as a means of survival. Indeed the concept of these future worlds tends to be one of man's struggling survival, with that basic need for simplistic functionality. Which, is then usually dramatically contrasted by the rather barren and bleak prospects presented by the lack of such required resources. This utilitarian desire and need, coupled with the bleak and tired feeling of the surviving remnants of humanity, is embodied quite marvellously within the costume design of such movies. Whilst although most eyes take in the complex digital graphics and beautiful landscaping of such dark and frightening future scenarios, my thoughts are first taken by the choices of costume and character design. For whilst the scene of a story is important to understanding the overall, in a visual medium (thereby in contrast to a written novel), character design and dress is to some extent even more important. The costume for humanity in such settings tends to follow a rather easy to follow formula. The most recent periods after the apocalyptic occurrence tend to be kitted out in pure functional clothing, of versatile knitwear, combat trousers, long wool coats and army boots. Here one notes that pattern and adornment is still very much prevalent, albeit faded and patched. The clothing resembles clothing of today, yet it is well worn and choiced for functional value. The far future however, where humanity has adapted to its new lifestyle however, often displays a far more fascinating expedition into sartorial options. Here we see that functionality and utilitarian production is the preferred basic. The remnants of clothing from the world before are long worn and destroyed. The production of new clothing follows a simple function: it must serve as useful clothing. That is to say, that clothing is stripped down to the bare necessities of living in a harsh environment. Fitted t-shirts and undergarments, of cottons and jerseys, beautifully draped and in colours of off whites and creams, reflect quite clearly the undershirts of times gone by. They show signs of dirt, sweat and hasty construction. These fitted garments lie in contrast to the knitwear which covers them. Thick knits of greys, deep reds and deep blues cover the individual in a seemingly one size fits all. Yet these admittedly oversized pieces, usually manage to suit each individual, perhaps the costume designer's way of making them more recognisable as characters. The unfinished and rolled hems display a construction based around hasty production and functionality, and yet they have a strange allure, indeed one that I shall later cover. Baggy trousers, with various pocket compartments, are eclipsed in use by thermal leggings, worn by both sexes, as a result of a decidedly practical and economic decision. These leggings are then worn simply tucked into or stacked upon thick boots, either engineer or military in design. This therefore provides a beautiful contrast between hard and soft, between the warm and comfortable knitwear against the harsh and strong boots. Yet functionality is key to all pieces, from the knitwear keeping the wearer warm, to the boots keeping the wearer able to transverse a multitude of landscapes. It would seem that humanity's need for survival takes dominance within the social sphere of perceived importance. 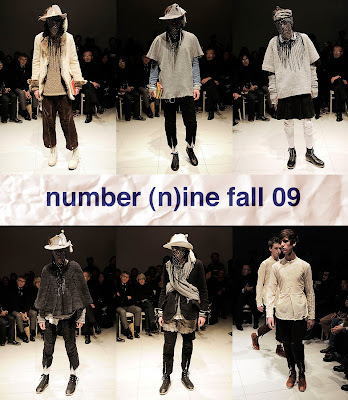 Art, design and fashion, which one would think vital to the development of society in the midst of change in light of such devastation, take a step back. Function and practicality are the words of the moment, and one sees the fashions reflect this entirely. Of course what films have yet to really explore, is how art develops within such future societies. However a settled world is far from ideal for any dramatic storyline, when thinking of a post-apocalyptic scene. The beautiful balance between function and design in such costume design really is one to be marvelled at. The knitwear, which is inherently cosy and comfortable, serves that primary function of keeping the wearer warm. The draping and wonderful raw scoop necks of such pieces stand in testament to hurried design and need for utility rather than fashion. The entrancing juxtaposition of warm knitwear with cold and functional boots, a play which would make any outfit appealing, is done out of contextual necessity. Congratulations for reading this far, I would give you a cupcake, but squeezing it down fibre optic cables could get rather messy. 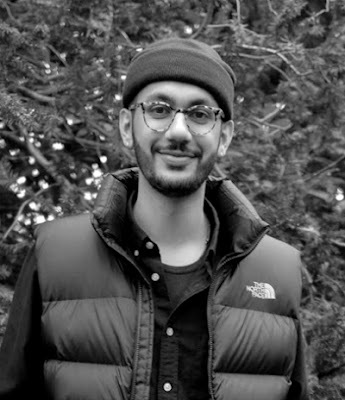 However, what I have been wondering as of late, is whether this is a look and a fashion that can be appropriated and made relevant to contemporary design. The answer, as I am sure many of you will have already thought when considering the costume design of such movies, will undoubtedly be yes. Raw and loose knitwear, contrasting to fitted leggings, and the use of boots, happens to be rather a well document style. Yet, it is the exploration of this style, in an artistic sense, within contemporary collections, which makes it fascinating. Away from the film setting, and in the contemporary world, these collections and styles are created by designers in the light of artistic endeavour. The styles can truly be explored and practiced, away from that bare need for survival. For although art may flourish in any environment, it would seem that in these movies, humanity has other priorities to first attend. * Movie stills courtesy of respective production companies. P.S. Please do take some time to read my recent interview over at the amazing Dream Sequins. So clever. I love how this post started and ended. So much to think about in the future of fashion..and glad you mentioned City of Embers. Very cool and quite historical in a sense..sort of back to the future in fashion. Interesting writing & great pics. Glad all is better for you. Really liked the movies you took your cue from on this one. So interesting. Cool. Sorry to hear about those internet woes. As always, missed you. An insightful dissection, let's hope the robots never come. Great post. You always write on some fascinating topics. You give us a lot to think about. I hope the rest of your week will go well. What an amazing analysis of future fashion as portrayed by film. I so enjoy your thoughtful and thought-provoking posts! hope you're feeling better. this was a really nice read. and so was your interview at DS. and Miharayashurio - are these for real? loved it! Interesting post! So happy you are back! excellent post! no matter what movie i watch i always take note of what the characters are wearing. you remind me just how cool his coat was in terminator. although my one irritation, where the women had a little too nice hair and makeup living in Post-Apocalyptic world. did you know charlotte gainsbourg was supposed to be in the movie but pulled out due to scheduling conflicts? 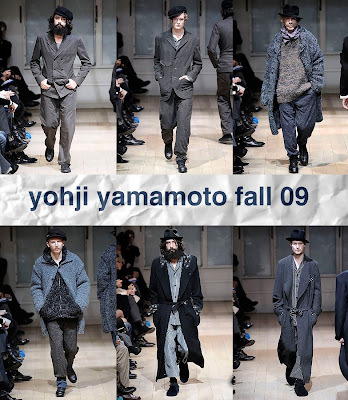 i like the designers you chose, definitely rick owens and any japanese designer do this look. I love Missoni so much! I just read your interview. You're very eloquent in how you present yourself in your writing, whether in interviews or here on your blog. DK, so glad you're well! I was getting worried and would've sent you an email if you didn't post today. I love what you said about the balance between function and design in costume design. Unfortunately it doesn't always happen and I feel for those poor (not financially of course!) actors that have donned some terribly uncomfortable costumes for our entertainment. Lovely interview at Dream Sequins! p.s. I fell asleep watching the latest Terminator. I thought Mr. Bale would've kept me up...sadly I was mistaken. I don't think I'll ever be as eloquent as you are. I hope you feel better soon. 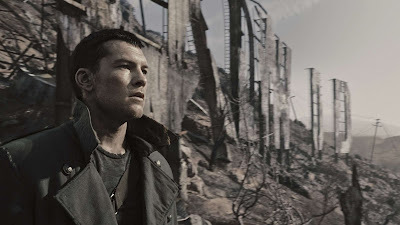 As for these awesome dystopian post-apocalyptic movies, I love them, but for the movie rather than the wardrobe. Sorry to hear about your health and internet issues, but hopefully all will be well soon! Can I just first say that the entire concept of the Matrix - when it first came out - blew my mind to the point where I completely questioned what we perceive to be "reality?" Of course by the time the sequel and #3 came out, I was so exhausted by Keanu Reeves' acting (or lack thereof) to even care. But yes, brilliant tie in with futuristic, deconstructionist design work (esp. a la Mr. Yamamoto), although I have to say that I thought "City of Embers" was rubbish. oh yes, you are absolutely right about this...it's already happening! though, i have a feeling our problems won't be machines in the future (already there's a shift towards biology in the works) the 'future is now', is very much now, and the look has started seeping into our daily attire for some time. i love the way designers put together the mens fall collections, all of it is so perfectly paired for eachother and it all looks so fabulous! Awwe, I'm sorry you've been ill and that you haven't had internet on top of that! Hopefully it will all be resolved soon and you'll feel much better! 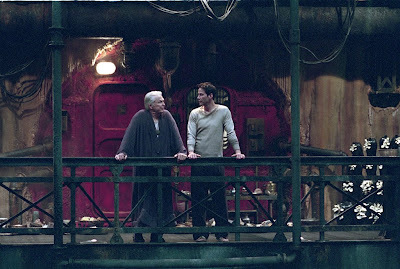 I love the deconstructed type fashion as seen in The Matrix - it fits in perfectly with the overall tone of the movie, with the darkness to it all. Lovely post, dear. I'm especially adoring the Yamamoto designs! huh! but i have never watched the other two movies. i love these men collection. bigger so i could style his outfit a lot. This is incredible...I love how you wove it all together. And will Missoni ever come out with a collection I don't love? I DID miss you! And thank you...we'll see what happens darling! AH has Carine always been there? SHE IS MY IDOL. Great insight. I enjoyed reading this very much. Ah you poor thing. Glad you are feeling better and is back with us. I had internet issue the other day and was beside myself b/c I couldn't work at all. I never really pay close attention to the costumes in those movies before except for period movies which I love! It's really interesting to think about what people would wear in 100 years from now on! awesome post on the fashion of the future..always a pioneer of sorts in that area. 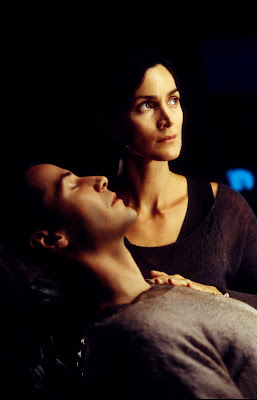 LOVEE Matrix :), such a good film!! Im gonna do a link thingy to your blog :) Really like it! Love this! Don't you think the bold shoulders in Bladerunner work so beautifully with the Balmain shoulder we were seeing everywhere too? What a great post! I had never considered the fashion of these types of movies. Great analysis and film selection. In case you haven't seen it, I suggest you check out "Children of Men." 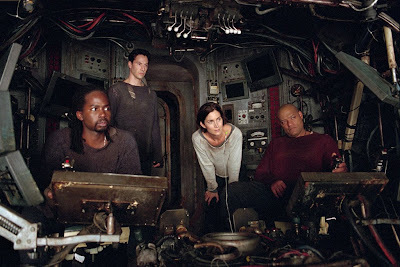 It's another post apocalyptic, dystopian sort of movie. Really amazing. hurray! I am glad you are feeling better and your internet is not acting finicky. Oh and I love how you mentioned how costume design can greatly progress a plot of a movie and even change the way we approach clothing ourselves. The way many things, not just clothing, are portrayed on screen often influence our actions quite heavily. It's both scary and fascinating. Great post! 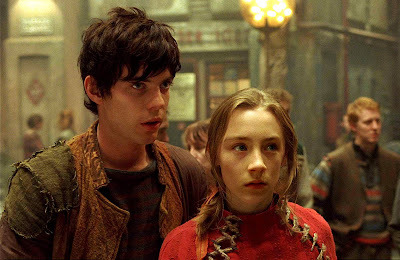 Love, love costume design on movies----absolutely LOVED City of Ember---what a great film and the concept and costumes were so fresh and familiar at the same time. Really interesting analysis. It's funny to compare our vision of the future now from say 50 years ago...a lot less optimistic. the movies aren't some for me but i really like the collections from marc jacobs, miharayashurio and missoni. I hope you're feeling better. Sometimes I sort of wish my internet would die for a few days, so that I could be free of it, but there are too many other places to get it! These are really interesting musings. 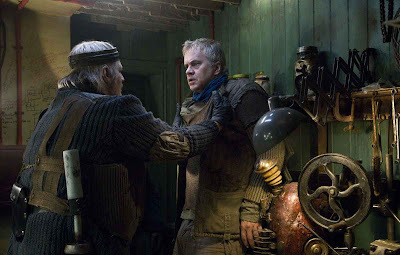 I particularly like the City of Ember stills. u're right bout functional clothing used in cyberpunk/dystopian era movies, reason is prob cos those times are filled with terror and d basic human instinct wld exude survival hence funtional clothing and less stylish garbs. future fashion as portrayed by film is such an interesting topic...Blade Runner is another good film too! Take care dear!! Ah, what a poignant observation! I've been thinking about this ever since the first Matrix came out and my better half spent most of our first years together searching for that perfect 'Neo' sweater: something that looked cool but was also practical. Surprisingly, it wasn't that hard to find (most of them coming from Belgian designers, Rick Owens or oddly enough, All Saints). I figured that this look came about, because it was functional and to be honest, if you're fighting for survival, the last thing you really care about is couture. And apart from the dirt, I think pale or faded colors always dominated due to the scorching sun. 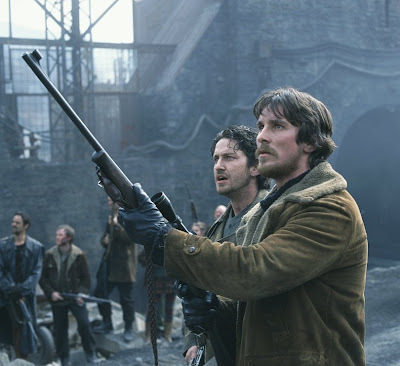 I would also like to applaud you for posting stills of Reign of Fire, a movie many deem to be cheesy, but I love dearly, not only because of Bale & McConnaughey (ok, they are hot), but how many movies like that feature dragons? P.S. Hope you're feeling ok health-wise. And I can relate to the internet problem. I actually wanted to post yesterday but my internet crashed... sigh. 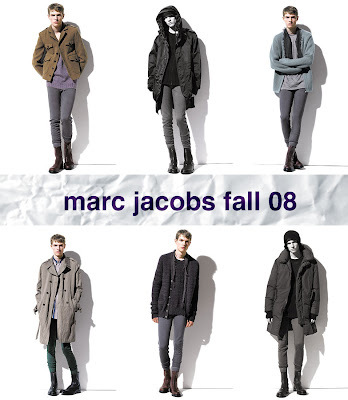 Loving Marc Jacobs and Rick Owens, darling! Fabulous post! what a pleasure it was to read something so intelligent and mesmerising. And the fabric of your post, that humanity is forced into function over fashion versus fashionable functionality is great for debate. 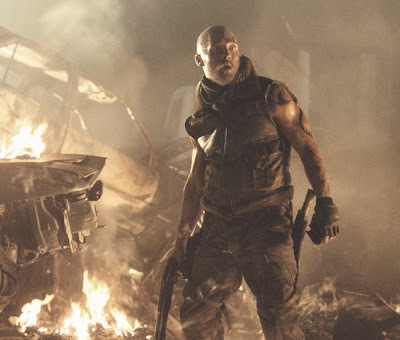 On a side note, hello Terminator Salvation and Christian Bale. what an interesting post! you, sir, are wonderful. and i've missed your blog terribly! i hope you're feeling better. p.s. you weren't by any chance in dallas two days ago, were you? or do you have a twin or cousin or identical friend in these whereabouts? i swear you were driving a car behind mine at mockingbird station. I loved this post DK! I love how intelligently it moves from film to fashion. I've always thought that working in the costume dept for a film would be just wonderful, the clothes definitely tell a story in themselves! 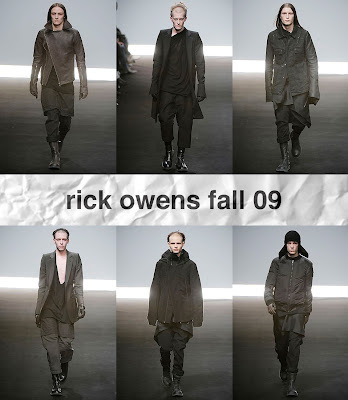 Wow, i love Rick Owens and Missoni! Hope you are feeling better! there has been some kind of a bug going around at the mo! Ah Keanu! *sigh*! I won't go and see Terminator because I watche dthe trailer and it was way too grim looking for me I'm afraid even though I'm a huge Christian Bale fan. Glad to hear you're on the mend - there's a lot of illness down here in Australia at the moment too. Hey, DK! I'm glad you're feeling better :) It's always good to take a break from the connected world every now and then. Way to come back with a bang though! I am a hugeeee fan of the Matrix Series. I have watched all the movies you mentioned, except The Terminator. The atmosphere is so essential, and costume comes back to a more primative and rugged style. Have a fantastic weekend.. and I tagged you on my blog to complete a survey if you ever get a chance! 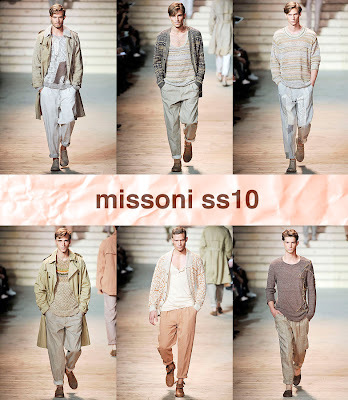 I really really like the mens wear from missoni because its not dark! i fee like men get sucked into so many borning colors but those are light and happy- but you already lean in the happy clothes direction :) Ill like to see your take on these! dk i'm back from not blogging! it's "arienette" from heartbreak stroll :D i missed blogging so much so i came back. i was hoping you could re-add me to your link list! Suddenly I'm inspired to rock an asymmetrical knit dress and some tough chick boots. Thanks. How's that for a superficial way to interpret your post. Ah ha. Loved your interview at DS! 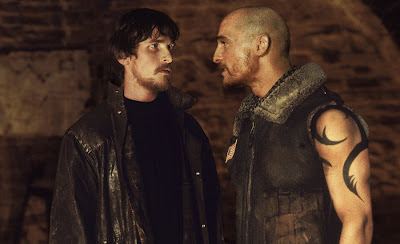 awesome post... i've always loved that vest that matthew mcconaughey wore in Reign of Fire... he was my favorite character in that film. I've been thinking of this sort of thing a lot lately. I'm really not sure why. I love technology (cue Kip), but I think of it as something that has worsened our society and civilizations instead of improving them. People solely rely on their cell phones, computers, etc for communication; dream of creating new, intriguing gadgets every six months, and really just shifting our population into this maddening abyss where we only leaning upon machines to get us by. Whatever happened to going outside and reading a book, writing, or thinking under a tree for leisure, or even merely talking to someone in person or sending a letter? The future is also an intriguing topic. Think back to every "advanced" civilization in time. Most of them fell. Shall we fall, also? What would that mean for us as a race? A Post-Apocalyptic world would be interesting in a terrifying way simply because so many humans wouldn't know what to do to survive without the reliance on others (and machines) to take care of them, feed them, defend them, etc. It's sad in a way, for we all know it will come some day. 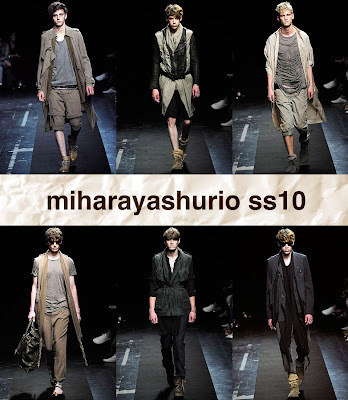 I absolutely love the Miharayashurio ss10 outfits. They're very humble and yet in a very lovely way. Hello there! I'm glad that you're well and back! Excellent post! I love your way of thinking and presenting your thoughts and how you mix all that stuff with fashion! Genius! Another outstanding post. I would also add the film, "Children of Men" as a good example of a film that sees a bleak future. I'll have to watch this film again and pay closer attention to the costume design. i didnt realise you were poorly, im glad your'e getting better, my laptop charger also broke so i havent been able to stop by. this post is fantastic, i watched matrix last night, and i couldnt help but notice the amazing PVC/ leather outfits.